Home of the Auchenflower Residents Alliance Inc. If you are a newcomer, please take the time to browse. Find out interesting things about our suburb. If you are an Auchenflower resident, you are invited to apply for membership yourself. We welcome people who value community spirit and maintaining Auchenflower's unique character and natural environment and would like to contribute to having a positive influence on it. As ARA has no commercial or political affiliations, this website has no commercial sponsors and does not seek such sponsorship. and specifically for Auchenflower, it can be found here. However, these links take you outside the Auchenflower website so don't forget to return to this website to learn more about ARA and this suburb! Sadly due to budget cuts, (How unusual!) the 'Our Brisbane' website is no longer available. 2016 AGM will be held in November -details to follow at a later date. In recent years a serious new threat to native plant species was detected in NSW. This has now spread and is present in South East Queensland and has also been detected more recently in North Queensland. This is an exotic fungal disease called Myrtle Rust. It is important that you acquaint yourself with this disease as it threatens a wide range of our native flora. An article about "The Hidden Creeks of Auchenflower" can be found either through the navigation menu "organisation" then "Auchenflower history" and following the link on that page under the heading "waterways" or more easily clicking here. This page will of course remain and can be located by using the navigation menu when this paragraph and its link are removed later. Just a brief reminder to existing members, Annual membership fees are due if you haven't paid yet. You may like to pay as outlined in the lower portion of the membership application page on this website. N.B. It was decided at the 2009 AGM to rescind the decision made at the previous AGM to raise the annual membership fee and to keep it at $10.00 per household. Many Auchenflower Residents took part in street parties on Australia Day. This helps keep the warm and friendly atmosphere that makes Auchenflower a great suburb to live in, and makes for stronger and safer community for all. The Auchenflower Residents Alliance initiated a project to create a pictorial record of all the houses and units in the suburb. This project began in 2004, The Year of the Built Environment and really should be ongoing. This is a community project, with the photographs being taken by members of the community, and displayed in a web picture album. The Auchenflower Residents Alliance Inc has an online membership form. - JOIN NOW ! 1. 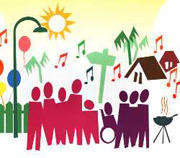 To develop community spirit amongst the residents of Auchenflower. 2. To positively influence the natural environment of Auchenflower. 3. To positively influence the built environment of Auchenflower. 4. To contribute to the safety and security of Auchenflower residents. 5. To be a credible, non-profit, non-political community organisation.